For the last 20 years, NVIDIA Quadro has been the de facto standard for professionals in dozens of industries who demand the highest level of performance and enterprise-class reliability and stability. Quadro RTX was built on that legacy — and the NVIDIA Turing architecture — opening new possibilities that will change the future of computer graphics. Get a look behind the scenes to see why Quadro is the GPU that professionals trust to do their best work. 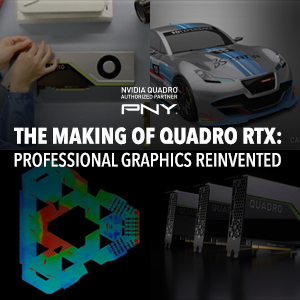 Learn more about Quadro RTX.